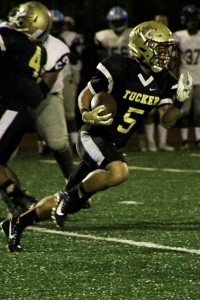 Tyler Hughey rushed for 165 yards and a touchdown on nine carries as the Tucker Tigers rallied from an early 6-0 deficit to defeat the Lovejoy Wildcats 34-18 to take control of the top of the Region 4-6A standings. Lovejoy (3-3, 3-1) used almost six minutes of the first quarter to go up 6-0 as Kahlil Arnold connected with Dayton Wade (8 receptions, 196 yards) on a 10-yard scoring pass with 6:16 left in the first quarter. The Tigers blocked the PAT. Zion Alexander returning the kickoff 73 yards to set the Tigers up at the Wildcats’ 15. A holding penalty backed the Tigers up and they were forced to kick a 27-yard field goal with Kyle Wright connecting to cut the lead in half at 6-3 with 4:08 left in the first quarter. Tucker (4-2, 4-0) forced a punt on Lovejoy’s next possession and put together an eight-play, 59-yard drive that ended in a 38-yard field goal by Wright to knot the game at 6-6 with 11:30 left in the first half. Travon Ford connected with Torezz Alexander for 20 yards and Isaiah Dunson for 21 yards for key plays in the drive. A 16-yard Hughey touchdown run was called back as the Tigers were charged with an illegal formation to force them to settle for the second field goal. Following a fumble on the Lovejoy 13, the Tigers forced a punt and needed just four plays to cover 67 yards. Hughey got into the act getting loose around the left sideline for 54 yards to the Lovejoy 13. Three plays later Donnie Harris went in from one-yard out, Wright hit the PAT and the Tigers took a 13-6 lead into the half. Hughey struck quickly for the Tigers in the second half as he went around the right side and down the field 67 yards for the touchdown with 11:05 left in the third quarter. Wright was good on the PAT again to make it 20-6. Four plays later Lovejoy answered with a 70-yard run by Baron Johnson to pull within 20-12 as the PAT was no good with 9:42 left in the quarter. Tucker held Lovejoy following the Wildcats recovery of a short kickoff and three players later Ford looked to the right and found Torezz Alexander in the flat. Alexander caught the short pass and raced down the sideline 53 yards for the touchdown. Wright was good again on the PAT for a 27-12 lead with 6:36 left in the third quarter. Lovejoy had a 31-yard field goal attempt blocked by Dunson, but was able to close the gap again as Arnold a 46-yard pass to Wade and a run of 28 yards to set up a three-yard touchdown run by Brenden Williams with 10:39 to play in the game. A two-point conversion pass went incomplete as the score was 27-18 in favor of the Tigers. Ford would score on a third and 24 as he dropped to pass, pulled the ball down and weaved his way to the right corner of the end zone and inside the pylon for the score as the Tigers answered again. Wright’s fourth PAT of the night made it a 34-18 advantage for Tucker. Lovejoy inside the Tucker 20 twice in the final 5:21 of the game before the Tigers forced turnovers on downs both times to seal the win. Tucker hosts Morrow (1-5, 1-2) on Friday at North DeKalb Stadium in a game set for 7:30 pm as the Tigers look to go 5-0 in Region 4-6A. In other Region 4-6A action involving DeKalb teams, the Stephenson Jaguars (4-1) improved to 3-0 in the region with a 29-12 win over the Martin Luther King Jr. Lions (1-4, 1-2) at Hallford Stadium. Stephenson pulled away from an 8-6 halftime lead to go up 29-6 before the Lions could put another score on the board. The win improved the Jaguars record against the Lions to 8-4 in 12 meetings. Stephenson travels to Tara Stadium this Friday to take on Forest Park at 7:30 pm while Martin Luther King Jr. travels to Twelve Oaks Stadium to face off with Lovejoy at 7:30 pm. DeKalb’s Region 5-5A got its region schedule underway on Friday highlighted by No. 10 ranked Southwest DeKalb’s 48-0 win over Chamblee (0-6, 0-1) at Godfrey Stadium. The Panthers improved to 6-0 overall and opened region play 1-0 behind some big defensive plays including Joshua Tate’s interception return for a score and his sack for a safety. Jaquann Smith got into the defensive scoring act with a 21-yard interception return for a touchdown. Southwest DeKalb also scored on special teams as Tommy Wright returned a kickoff 88 yards for a score. Four of the Panthers touchdowns came in the ground game led by Dontavious Spearman’s two rushing touchdowns on 48 yards rushing. Chette Williams and Sadir Ryan each scored a rushing touchdown. The Panthers are now 13-2 in 15 meetings with the Bulldogs. Arabia Mountain (3-3, 1-0) evened its overall record and got the region schedule off to a 1-0 start with a 23-6 win over Miller Grove (1-4, 0-1) at Avondale Stadium on Friday night. The Rams jumped out to a 15-0 lead on the way to the win. Arabia Mountain is now 4-1 in five meetings with the Wolverines. The Lithonia Bulldogs (4-2, 1-0) picked up just its sixth win in 19 meetings with the Columbia Eagles (1-5, 0-1) in a hard-fought defensive battle that ended 7-6. Region 5-5A takes a week off from region play this weekend before resuming on October 12.